Could we finally learn when the game is coming out? We'll have to wait until Thursday to find out. If you're a Star Wars fan and an MMO fan then you might want to pay particular attention to the San Diego Comic Con this week, and particularly on Thursday as BioWare says it has a few announcements to make about Star Wars: The Old Republic. BioWare and LucasArts will hold a panel about the game on Thursday, July 21st at 3:30PM in room # 6BCF. 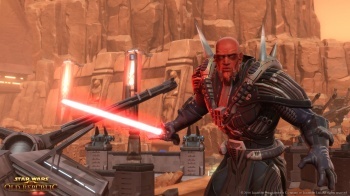 Writing on the official Old Republic website, BioWare said that as well as the mysterious announcements, it had new gameplay footage to show and would be answering questions from the panel audience. There will also be the opportunity for attendees to play the game at the Star Wars pavilion. As to what the announcements might be, the most likely is a release date - something that BioWare has kept very firmly under wraps for quite some time. It might also be the announcement of an open beta for the game. Heck, it could be both, as BioWare did say that it had more than one thing to announce.